Imagine coming to LdM for a study abroad experience and leaving after a couple of months with the knowledge of having your own cacao tree planted in Africa. This is what recently happened to the 16 students who attended our Sustainable Design and Sustainable Architecture courses. Last Fall 2013 LdM decided on a collaboration with Treedom, a brand new company founded by two young Florentines. Their motto: let’s green the planet! 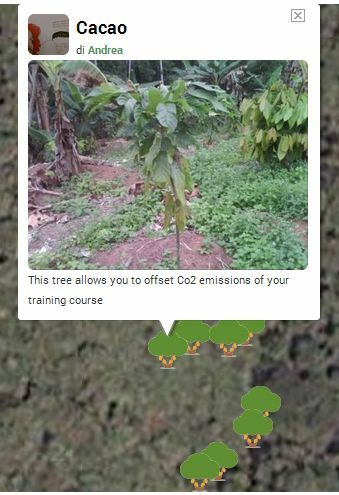 As this goes hand in hand with the norms and values of our Institute, we asked the people from Treedom to calculate the amount of CO2 emitted by above mentioned courses. Treedom calculated that the “Carbon Footprint” resulting from heating, cooling, electric energy (for lights, projector and computers), waste production and paper usage, was equivalent to 654Kg of CO2. Each of the 16 cacao trees planted is going to absorb 55Kg of CO2 during the growth in ten years, for a total of 880Kg. It was agreed to select a number of trees higher than needed, so that every student could have a personal tree.